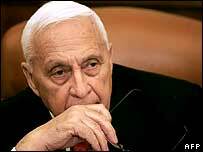 Israeli Prime Minister Ariel Sharon is to be kept heavily sedated as he fights for his life after suffering a major stroke on Wednesday. Doctors in Jerusalem say they will keep the 77-year-old leader in an "induced coma" for up to 72 hours. Earlier, he underwent seven hours of surgery to stop bleeding in his brain. The BBC's Jeremy Bowen says his stroke changes every political calculation with no-one, including acting PM Ehud Olmert, commanding such Israeli trust. Elections scheduled for 28 March are to go ahead as planned. Our correspondent says at any rate a successor may not have the will, experience or desire to follow Mr Sharon's plans. The director of Hadassah hospital in Jerusalem, Shlomo Mor-Yosef, said Mr Sharon was in "a severe, but stable condition". Mr Sharon was being kept heavily sedated to reduce the pressure on his brain and keep his blood pressure down, to allow his brain to recover from the trauma of the stroke and subsequent surgery, he said. Mr Mor-Yosef refused to make any prognosis about the long term effects the stroke could have, emphasising that it was impossible to assess motor or cognitive skills while a patient was in an induced coma. However, he did say that Mr Sharon's pupils were responding to light as they should be. Mr Mor-Yosef said that he was not sure when the prime minister would be allowed to re-awaken, but it would be a very gradual process that was unlikely to take place for at least 48 hours after emerging from his surgery. 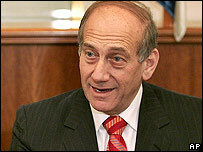 A sombre and anxious Ehud Olmert opened the morning cabinet meeting on Thursday. "Israel's strength will allow it to face the situation," he said, adding that they were praying "for good news from hospital". Prior to the meeting, ministers from the right-wing Likud party agreed to postpone its planned resignation from the government, which had been scheduled for Sunday. Aides to party Chairman Benjamin Netanyahu said he would support Mr Olmert's leadership and contibute to the sense of political stability, Israel's Haaretz newspaper reported. Chief Palestinian negotiator Saeb Erekat told the BBC's The World at One programme he was concerned about the possible effect Mr Sharon's absence would have on the peace process. "I'm really worried that the competition to replace Mr Sharon will be marred with more escalation against the Palestinians whether in the form of assassinations, arrests, incursions of settlements and that worries me a lot," he said. Newspapers and television in the Arab world have been carrying minute-by-minute updates on the condition of the Israeli leader, a deeply unpopular figure among many Arabs. Reporting has been largely neutral, observers say. Mr Sharon was taken to hospital on Wednesday evening, less than three weeks after being treated for a minor stroke in December. Doctors said the prime minister had suffered a "significant" stroke and subsequently required two separate operations to stop bleeding in his brain. Mr Sharon, who is seriously overweight, was prescribed blood-thinning drugs after December's stroke and told to diet. He had been due to have an operation on Thursday to close up a small hole in the heart which doctors believed may have caused the earlier stroke. Mr Sharon, who has been prime minister since 2001, had been planning to run for a third term in office under his newly formed centrist party, Kadima, after quitting the ruling Likud party in November. Polls had suggested his new party was in the lead ahead of the election in March. BBC diplomatic correspondent Jonathan Marcus says one of the questions to be answered is whether Kadima can rally smoothly around a new leader, presumably Mr Olmert, or will suffer a bruising leadership struggle.